Heroine: I like that Philippa Marbury is exceptionally different than other romance heroines. For instance, she wears glasses. Secondly, she likes science! I’m usually a sucker for protagonists who go out of their way to learn – even if this isn’t something that’s expected for women in the time period. Hero: My main issue with this book is Cross. His reasons for being a “tortured” hero just didn’t compel me enough. I can see why he would feel guilty over his brother’s death, but it didn’t make sense to me for him to put that much burden on himself. I just wanted him to stop feeling sorry for himself as opposed to empathizing with him. I like the fact that he was noble enough to not want to ruin Pippa, but I wasn’t falling for his reasoning of him not being a worthy suitor. Supporting Cast: I’m really looking forward to learning more about the rest of Cross’s friends in the upcoming books. I really like their dynamics as a group in the Fallen Angel. Romance: No complaints on the romance aspect. 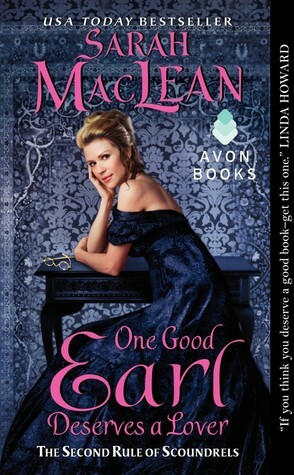 As can be expected from any Sarah MacLean novel, One Good Earl Deserves a Lover is steamy. This is the first Sarah MacLean book that was just average for me. I guess not all books can be winners. I’m still definitely looking forward to reading more of her books in the future though! Hmm, I loved Maclean’s 9 Rules to Break and 11 Scandals to Start, but the first book in this series disappointed me, so I wasn’t sure if I was going to be picking this one up. After your review, though, I think I will–like you, I adore glasses-wearing, science-loving females (have you read Tessa Dare’s A Week To Be Wicked? Phillipa sounds similar to the protagonist in that one), and I might be able to put up with the hero to read about her.